I decided to take the advice of an old friend and clean up the photos folder on both my phone and computer. Let’s just say that was exhausting, but I ran across the featured photo. A picture that I took about 6 years ago while visiting Richmond, Virginia. It was before I began my first year as an intern, and I was taking in historic sites during a weekend getaway. This picture reminded me of no matter how beautiful we think the path is, there will be a level of uncertainty along the way. Even though the view at Maymont was absolutely immaculate, I had to reflect on the road that it took me to get there. Seven months prior to visiting I was in a hospital bed attempting to process a grease burn accident that could have ultimately ended my life. The road to recovery wasn’t easy, but in order to get back to my old self it was going to take some hard work. Road blocks can pop up at any time on your journey. That particular road block came in during my second semester of graduate school. There were plenty of do overs, but trust me I needed the extra time to get myself together; mentally and physically. In my own journey I’ve experienced loss of money, resources, and loved ones, but I’ve gained an awareness of self, strength, and a degree. The road leading to what you truly want is never easy. The main thing is that you continue on the path to achieve what you want out of this life. You know the easiest thing to do? I’m not here for that option though, and you shouldn’t be either. I spent most of last year preparing for when those moments get shaky, or uncertain, cause trust me those moments will come. That’s when you tap into the strength, and resources that God has blessed you with to keep chugging along. We may have setbacks, road blocks, and detours but we can all learn a thing or two from, “The Wiz, or Wizard of Oz.” It ain’t EASY, but man it is worth it. We all must seek our own yellow brick road. No matter how hard it gets you have to keep going. Here’s to something beautiful at the end of our own yellow brick road! Every relationship has taught me something. Work relationship, romantic relationship, business relationship, and the list goes on. I’ve experienced some bitter departures, and some that ended quite amicably. Bottom line relationships can end. Relationships can also blossom into something beautiful. When I took this photo on Valentine’s Day 2016 I reflected on the past relationships that have come, stayed, and disappeared from my life. I can’t regret any past relationship because they have shaped me in some way. I know what to allow, what I need, and what I want because of them all. 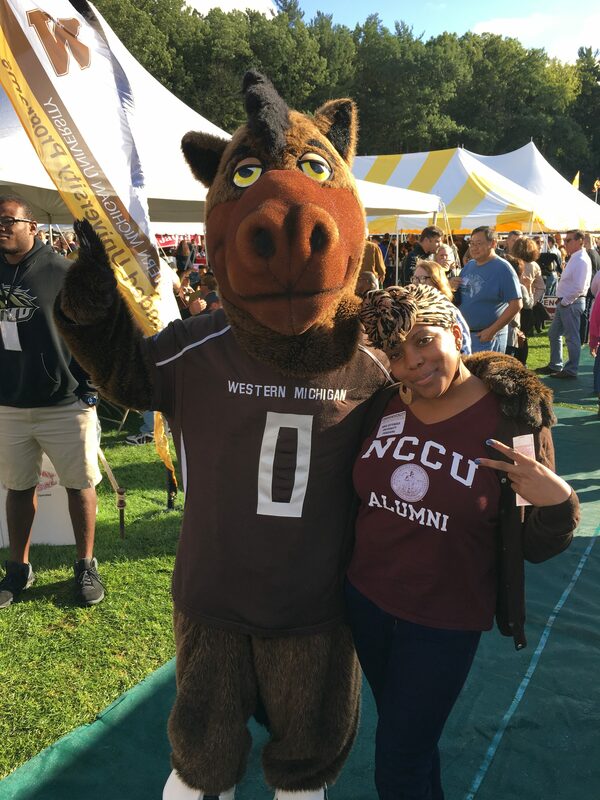 I’m #SteeleThankful for my foundation. Becoming first generation college graduates was important to my parents, especially my father. The goal was that all three children obtained a college degree. Often times I believed it was forced upon us to go to college, but now that I’m older I understand the foundation that was instilled in us. It wasn’t about an education, it was also about the life experience. It was problem solving skills, friendships, relationships, and preparation for the real world. My parents always wanted better for my siblings and myself. Their strong foundation is the reason why I will always strive to want better for myself. Settling for mediocre is not an option. I’m #SteeleThankful for the ability to overcome FEAR. I was in a place of absolute fear about this time in 2014. I completed my 90 day probation at my job, and it seemed as though all hell had literally broke loose. I became extremely unhappy in my current position, and fear came over me. My fear was that I was going to be stuck in a position that hindered me from pursuing my dreams. Fear can keep you in a very comfortable position. The same position that will keep you keep you sitting on the gift that God gave you. When I recognized the power that fear had over my life I had to make a decision. If you want great things to happen in your life you have to kick fear, and step outside of your comfort zone. I had to stand firm on my faith, and believe that fear had no place in my life. I gave fear the deuces in 2015, and I refuse to look back. There’s some things we can take for granted. When I moved away from my hometown I longed for a beach. Somewhere to go, and think by a large body of water. I didn’t take many trips to the beach when I was a child for fear of drowning because I didn’t know how to swim. I didn’t appreciate the calming waves until it wasn’t in my reach. Whenever I came home to visit this place it provided a sense of peace. I think we all deserve a place that we retreat to that creates peace for us. It could be the beach, a museum, bookstore, or even your home. Never forget that NOTHING, and I do mean NOTHING compares to a peace of mind. When I look at this photo I can’t help but get misty eyed. I attended a Montessori elementary school, so I had the same teacher for three years. This lady was one of them. When I was being bullied she protected me. She welcomed me into her home as a little girl along with some of my closest friends in order to soak up more knowledge after school. It’s been years since I ran into Mrs. Elwell. 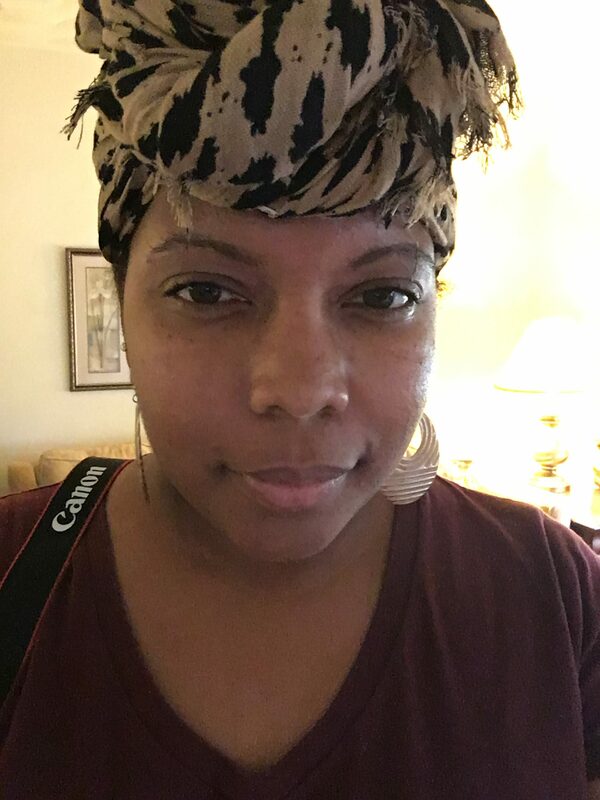 I was a vendor at a natural hair event. It was my first time showcasing my new book to the public. Mrs. Elwell walked into the room, and this moment happened. She had no idea that I had written, and published a children’s book. She was overcome with joy that she began to cry. Tears of joy. We laughed, reminisced, and celebrated life in this moment. I’m #SteeleThankful for the same joy that I experienced as the little girl learning in her safe space, and the joy of sharing this special moment with one of my favorite teachers. I enjoy my freedom. The freedom to go and come as I please. It’s truly something that I cherish above a lot of things. What happens when your freedom is threatened? I allowed my mind to be attached to things because those things represented someone that was no longer around. This storage space was occupied for over 3 years with items that belonged to my father, and quite frankly it was hard to let go. Not anymore. Holding on to the items wasn’t going to bring him back, and was the key to my freedom. This chapter of my life is now complete. So, on this day, I announce to the world that the shackles of unpacking my grief have been broken. This Challenge WILL Change Your Life! You down? Happy Halloween! 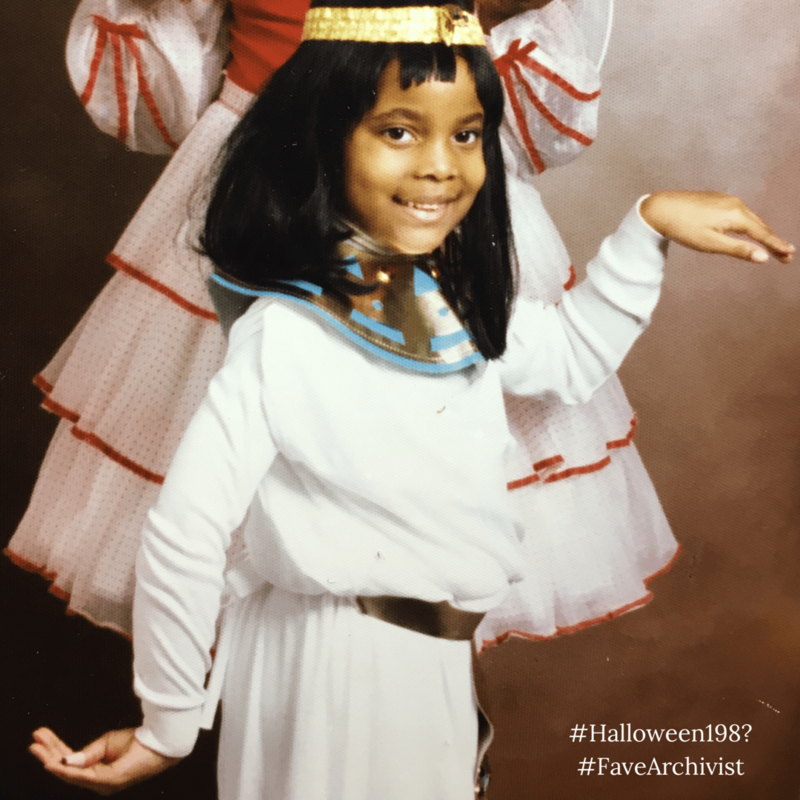 I was feeling quite nostalgic, and this is probably the last time I wore a Halloween costume that I loved. Queening since 1989-1990 Lol! 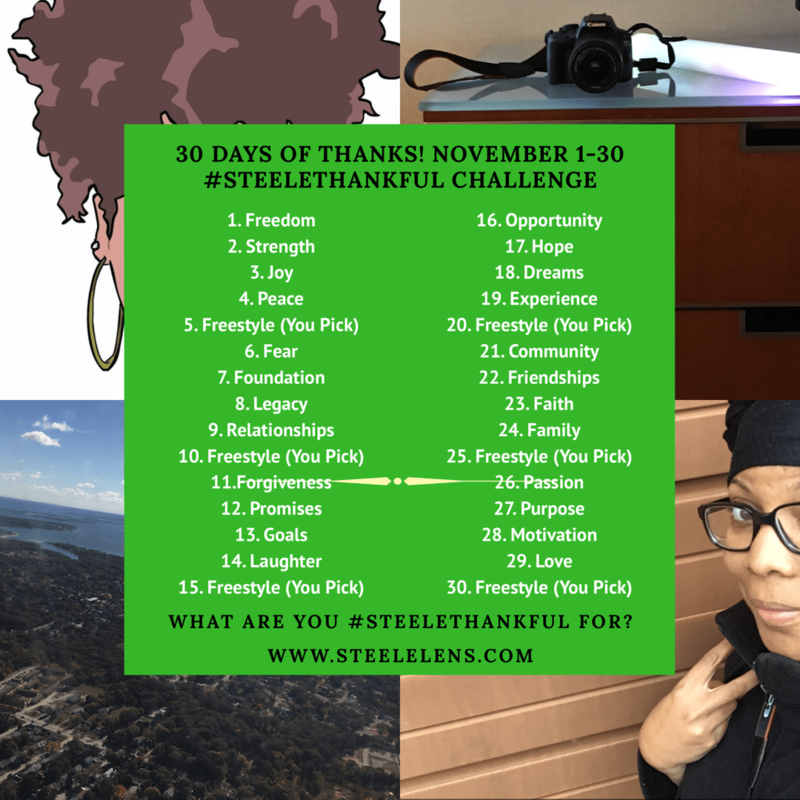 The second annual #SteeleThankful Challenge kicks off tomorrow, and I’ve had people asking me well what is it really about? In a world where there is so much chaos, unhappiness, fixation on material things, I feel there is a need to really look inside of ourselves, and find what we are truly thankful for. The best time is to do so in the month of November. The month that we observe Thanksgiving. It’s also the perfect opportunity to not only encourage yourself, but encourage others as well. Have you looked in the mirror today? Seriously. If not the mirror, clip the camera icon of your cell phone, and have it face you. Let’s start with being thankful for being able to receive this message today. Example: I’m #SteeleThankful that I’m here to celebrate another day with my family, because last year I didn’t know how I would make it to the next day, let alone another month or year. Everyday is a new opportunity to strive for greatness, and continue to make myself happy. As I stated before this challenge is only in the 2nd year. I can see this challenge gaining momentum, and I have to truly let the process flow. There will be changes along the way, so let’s enjoy this ride of transparency, and thankfulness. I know that it sounds easy. But, I’m here to tell you that it’s not. I can tell you how empowering it feels to share your struggle with others on the road to absolute gratitude. When I was in Rhode Island for the World Burn Congress a couple of weeks ago I realized how hard it was to tell my own story. YES. You read that right. Hi, My name is R.J. I’m a storyteller, and I’m sensitive about my SH*T! No one can tell my story like me, but that’s difficult. When telling our own story we sometimes tend to ramble, or leave out the portion of the story that we don’t want to own. I feel the same way it comes to sharing my journey during the #SteeleThankful challenge. When I have to edit, and post a story for the Final 48 Project I will read it NUMEROUS times before I decide to schedule the post to go live. I’m super protective of the stories that are shared on that platform, and I try my best to uphold the integrity of every person’s story. I mean they chose to share their stories with me, in order to share with the world. Encouraging others along the journey of grief is never easy. Especially when you are still dealing with your own. I can’t wait to share this experience with all of you this year. So much has happened from November 2015 to Now. I’m sure the same for you. Let’s embark on this journey together, and tell the world what we are all #SteeleThankful for? P.S. S. I share the true meaning of the #SteeleThankful name during the challenge this year. Are you ready? It’s going to blow your mind! What is that? What does it feel like? A new pair of shoes? A budding romance? Waking up with purpose every morning? I’ve fallen in love with people, and I’ve fallen in love with items. Nothing compares to falling in love with what God has placed you on this earth to do. I’ve heard numerous people say that if you trust the process, activate your gifts, live in your purpose, then the money will come. I’m not saying sit back, and the money will flow right in, because work is necessary. Instead I’m saying that it happens. God will give you ideas, people to bless you at the right time with their resources, and you will flourish. “The timing isn’t right.” Honestly when will it be right. You read that correctly. You have to separate from some things, or focusing on yourself in order for things to happen. Now, it’s no secret, I haven’t been sleeping well for weeks. My mind races all through the night. There’s something I’m sitting on that needs to be birthed, and I’ve been trying to do this thing all by myself. I accepted this assignment. I’m going to continue to trust this process. The person that truly loves me, died for me, continues to provide the resources for me to keep thriving. I’m a STORYTELLER. I had to finally own that, and walk confidently in that space. It spans across my multiple platforms when it come to the children’s book series, Adventures of Alleykats, with the stories for Final 48 Project, and this platform that continues to evolve with Steele Lens. So, will true love pay my bills. Well, I’m STEELE standing right? #SteeleThankful Challenge 2016 is coming! Be ready to share what you’re thankful for next month! I’ve been listening to a lot of Aaliyah lately. The anniversary of her passing was a couple of weeks ago, so I noticed a lot of her music has been on my mind lately. I told you about the Bad Boys Reunion Concert that I attended in Chicago on September 1st right? The seats were the bomb, and I was on my feet the entire time singing along to all the great songs from the 90s. This past week I’ve had that feeling of “take me back.” Take me back to an event, or even a time with a person when it was all GOOD. When there was not a care in the world, or you simply enjoyed being in their presence. Then it hits you. Maybe I shouldn’t hold on to what was, and focus on what can be. Memories get me through some of my toughest moments. This week I found myself laughing with my mom and sister about the hilarious stuff my father would do or say. I laughed with old friends about the adventures in our late teens, and early twenties. What was I going back to? Again I say memories are great, but sometimes we hold on to the wrong memories and they can cause us more heartache and pain. I know sometimes I find myself holding on to a memory that is quite toxic for my future. How will I grow if I don’t let go right? I can never forget how some events or people made me feel in the past, but it’s also important that we have to let some balloons of hope go. I will be the first to admit that sometimes it’s hard for me to let go of how a person treated me; good and bad. Take me back to our first date, take me back to the Juvenile and Trina concert, take me back to my senior year of high school, take me back to the night before my house fire accident, take me back…take me back…take me back. The thing is time doesn’t move backwards, it only goes forward. I can’t continue to focus on what could have been or what should have been. I can focus on the now, and how I can plan a better future for myself. I’ve made some foolish mistakes, and some that I am still learning from. I realized this week there are some things I can never get back. Chile, at the top of my list is time and money, I can never get those two back. I can’t dwell on wasted time with people, or money that magically drifted from my bank account. Even though it’s painful, the best thing you can do for your growth and sanity is to let go of the notion of traveling in a time machine to get what was…back. The truth is…it’s gone. Give it some time, and if the opportunity presents itself again, then try again, but definitely don’t build the foundation on quicksand. You feel me?